Despite the weaker results, Q3/2017 registered a positive result when compared to the same period last year when the company reported a loss of R$16.4 million. 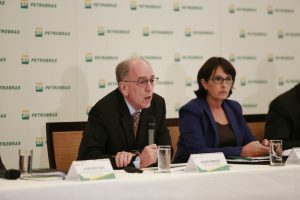 SÃO PAULO, BRAZIL – Petrobras, the oil giant of Brazil, announced its third quarter results yesterday (Tuesday, November 14th), with a net profit of R$266 million for the three-month period. The results were significantly lower than that expected by the market. Petrobras president, Pedro Parente, speaks about Q3/2017 results in Rio de Janeiro, photo by Flavio Emanuel/Agencia Petrobras. “The result was lower than the market expected, but this was due to extraordinary items, which totaled around R$2 billion,” explained president of Petrobras, Pedro Parente, according to Reuters news agency. “These [extraordinary items] reduced the result in this quarter to numbers of around R$300 million reais, [but] still positive,” added Parente. According to officials, the results were slightly lower than the previous quarter, which registered a profit of R$370 million, but a positive result when compared to the same period last year, when the state-owned company reported a loss of R$16.4 million. For the first nine months of the year the company registered an accumulated net income of R$5.031 billion, well above the loss of R$17.3 billion registered during the same period in 2016. “The net profit results so far this year were determined by higher net exports of oil and oil products at higher prices, lower margins and sales volume of derivatives in Brazil, lower personnel costs, lower dry and/or sub-commercial wells, [as well as] gain from the sale of NTS [state-owned subsidiary] in the second quarter of 2017,” stated Petrobras in a statement released Tuesday night. During the press conference to announce the results, Parente also noted Brazil’s petroleum production increase by 2.7 percent, the increase of crude oil and oil product exports, by 39 percent and the decline of imports by 19 percent in comparison to the same period last year.